We have been told that it never rains in Valencia. They lied. Of our six days in Valencia, it rained for three of them including this morning, our last chance to explore the city. I went to mass at the cathedral and then walked around in the rain a little bit. With luggage to pack and the desire to stay dry for a day of travel, I only stayed out for about an hour. Mandy and I visited a cute cafe where we enjoyed our last coffee together. We were both a little sad to be leaving Spain, but also were excited for our evening adventure in Zurich. We left the SH Hotel Inglés at noon sharp (thanks again to all of those who made our travel arrangements for us) and were at the airport within about 15 minutes. We flew Swiss Air from Valencia to Zurich. This is only a 1 hour and 40 minute flight. Although, when you sit next to a woman who had a cat on her lap the entire time, it can seem like an eternity. I seriously thought she might let him get out and jump around the cabin. It was a bit strange. 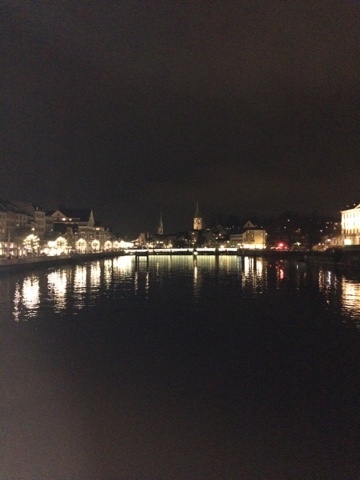 We arrived in Zurich at 5:30pm local time (same as Spain time). We changed hotels at the last minute to save money. 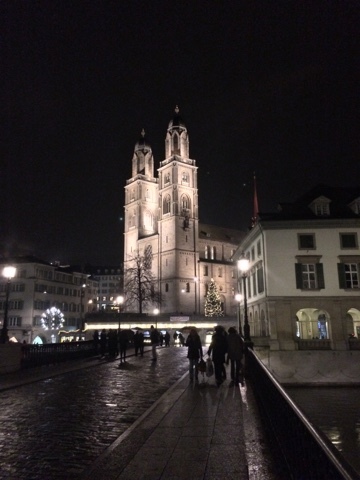 We were booked at the Zurich Marriott, but then found a better deal at the Hotel Allegra at the airport. It was a beautiful, clean and modern hotel! 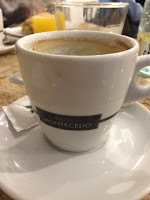 Great advice from some of our new travel friends in Valencia! They say that the trains in Switzerland run like their clocks, on time! We found this to be true. 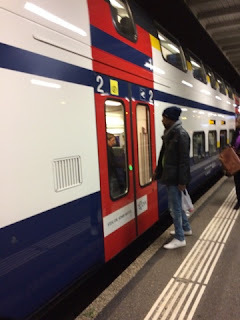 We dropped our bags in our room and then walked out the back door of the hotel to the train station where we caught the 5:55pm bus to the city center. This cost us each 13 Francs (about $13 USD) for a 24 hour ticket for the bus, train, streetcars and boats of the city. Not a bad deal! The train dropped us off promptly at 6:10pm for a night of exploring! It was cold and misty in the city, but that didn’t hamper our enthusiasm. 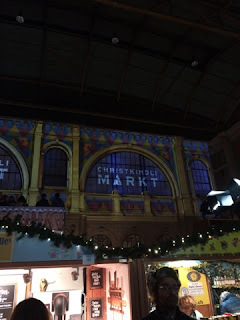 The central bus station was hosting Europe’s largest indoor Christmas Market. 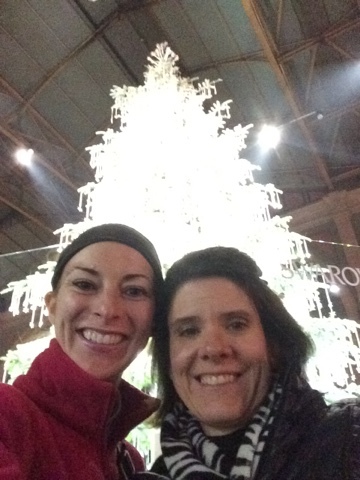 At this market, the largest Swarovski Christmas tree is on display. 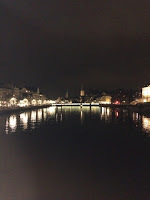 We knew that the market didn’t close until 10pm so we decided to take a walking tour of the city by night. Honestly, it was possibly the highlight of the trip for me! I felt at home in a country where my maiden name is posted throughout (Rauch means smoke…lots of No Smoking, streets with smoke in the name, etc.). Don’t get me wrong. I loved Spain as I knew I would, but my ancestry is much more German, Swiss, Austrian than anything close to the Mediterranean. I loved walking past the various beer houses, chocolate shops, restaurants and designer stores. The city was in its full Christmas spirit. 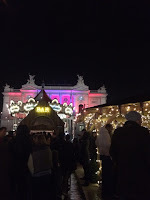 The entire city was lit up (even lights that hang across all the main streets of the city) and festive. Nuts were roasting everywhere and the glühwein was flowing freely. This is a delectable concoction of red wine, mulling spices, liquor and sugar. Mandy and I stopped at the famous Zurich Singing Christmas tree to buy some in a souvenir mug. We used it to get refills back at the train station. One cup is not enough! 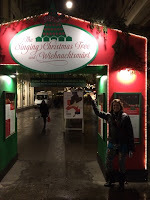 We stopped at a small restaurant in the old town area of Zurich. Fortunately, there was no wait. We did have to share a banquet table with a family with young kids, but that made for a fun and lively dinner. Both Mandy and I chose a Swiss Christmas beer with the boiled meat supper. We got wurst (sausage), pork, bacon and beef with boiled potatoes and sauerkraut! It was delicious and such a nice change from all of the olive oil and seafood! The meal started with a nice warm soup with little fried dough balls. 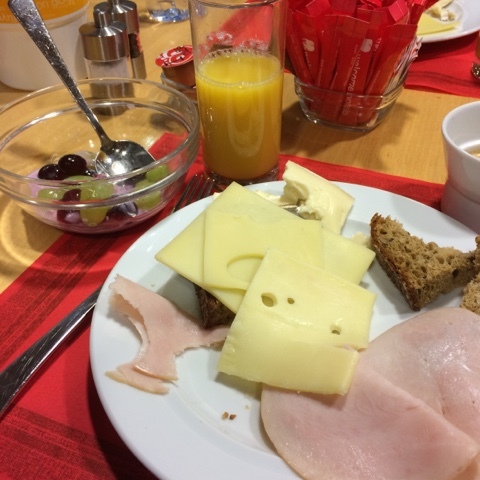 It was hearty meal, but so delicious! We walked around for about 3 hours before heading back to the train station to shop. We took pictures of the gorgeous churches, the designer stores (Jimmy Choo anyone?) and the Christmas displays. I picked up a couple of gifts at the market before we grabbed the train back to the hotel. We set our alarms for 7am and drifted blissfully off to sleep with dreams of returning home tomorrow. 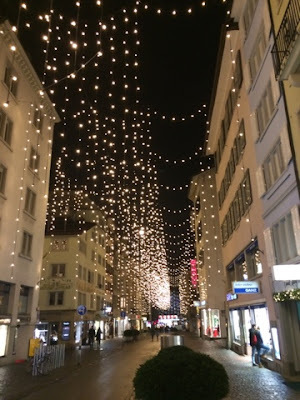 Our night in Zurich really put me in the holiday spirit and was a great way to transition back to the reality of what it sure to be a crazy, hectic holiday season!